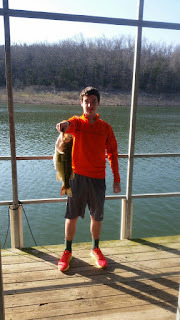 Norfork Lake is providing some exciting fishing for all the anglers with all species. During the month of March we had warm fronts followed by cold fronts on a continual basis. Very typical of March, but I prefer warm fronts. The lake temperature is in the mid to upper 50's and should cross the 60 degree mark very soon. The fish will get even more active and top water action should become more consistent. We did have some good top water action days in March, however, which is not typical. I will take it! 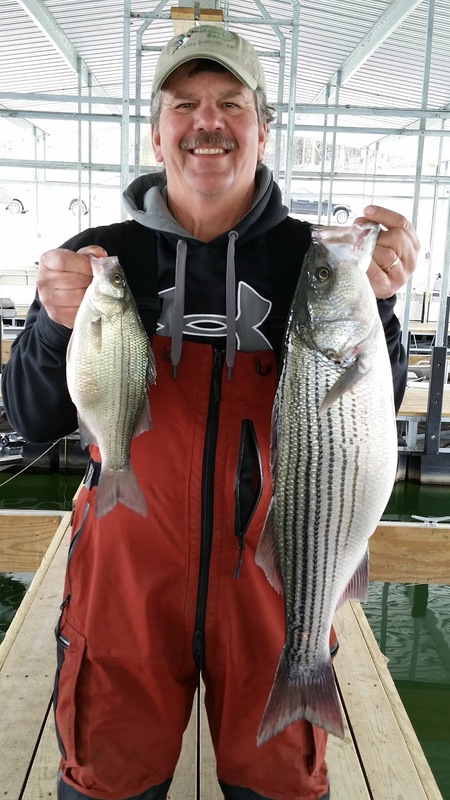 Striped and hybrid bass action has been improving daily. Live bait is working really well. A couple of my guests took Jim Nichols of Nichols Guide Service out Saturday morning and the big fish was 15+ pounds. 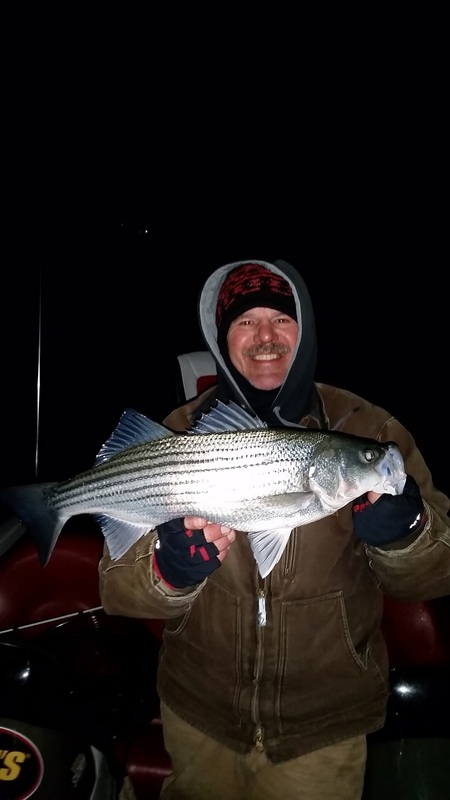 Look for stripers on shallow flats and points early and late in the day as well as after dark. The best depth at these times are in 5 to 20 feet of water. They will be chasing shad so have a good top water bait handy or do what I have been doing and use a Kastmaster or blade type bait. The Kastmaster can be used as a top water bait or as a bait to sink to get to those deeper fish. I cast it, as well as, vertical jig it when I find fish on the bottom. The after dark bite is still going strong. 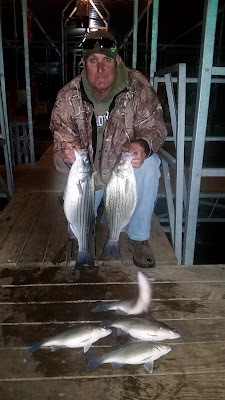 Look for an elongated shallow point with deep water nearby and if you mark bait the stripers will be in the area. Throw out a suspending stick bait and work it slowly back to the boat. You can also try other methods of retrieval such as jerking and stopping, on occasion this will work, but the slow retrieval is typically the best. Last night a few twitches then stop method was working the best. 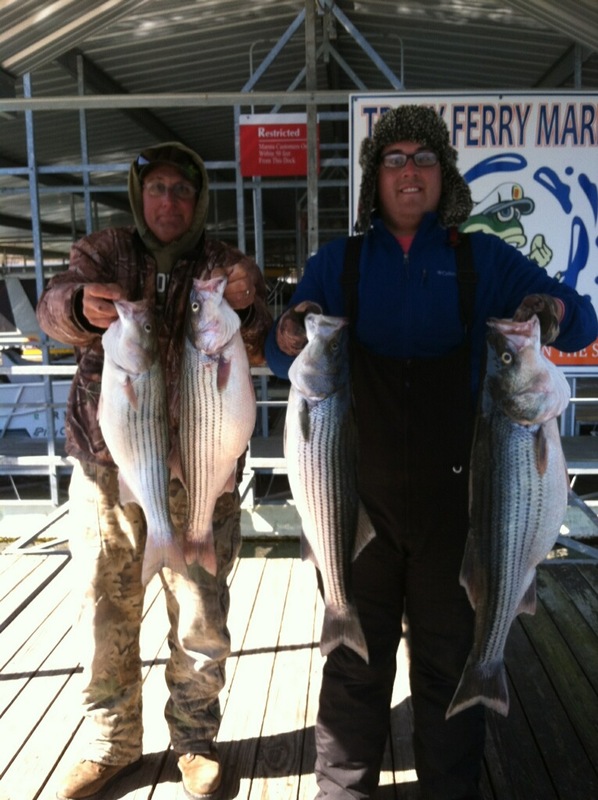 We landed a hybrid and striper and missed several others. The fish were really tight on the bank last night. We had to get the bait within a foot of the shoreline, so to say the least we caught a lot of buck brush last evening. :-) During the middle of the day look out in deep water near the channel, and again, if you can find the bait the stripers will be close. They are being found 20 - 35 feet down and trolling is a great method of catching these fish. Fish are being caught all over the lake from Big Creek to the Fouts area and back towards the Red Bank area and a lot of places in between. 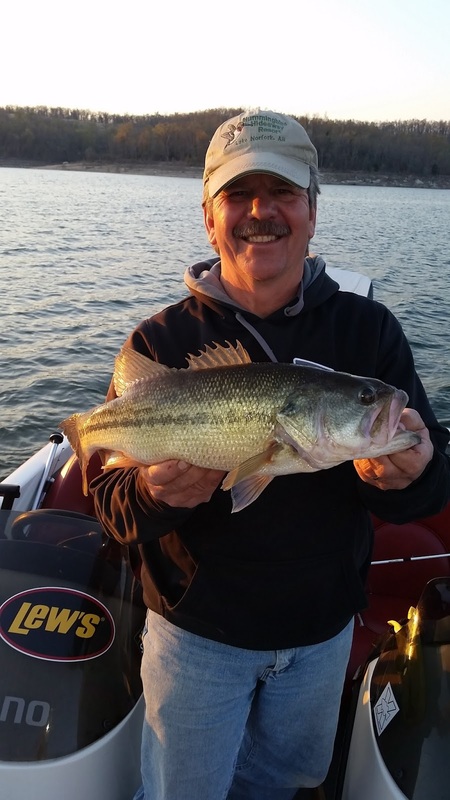 Largemouth bass fishing is still very active. The fish are feeding along the deep bluff lines during the day and are on the flats feeding on shad early and late in the day. I landed a nice 4 pound fish last evening vertical jigging with a spoon in 23 feet of water on a big sandy flat. Too bad that John didn't catch this bass as it would have been in the running for a Hummingbird Hideaway Resort Derby winning fish. 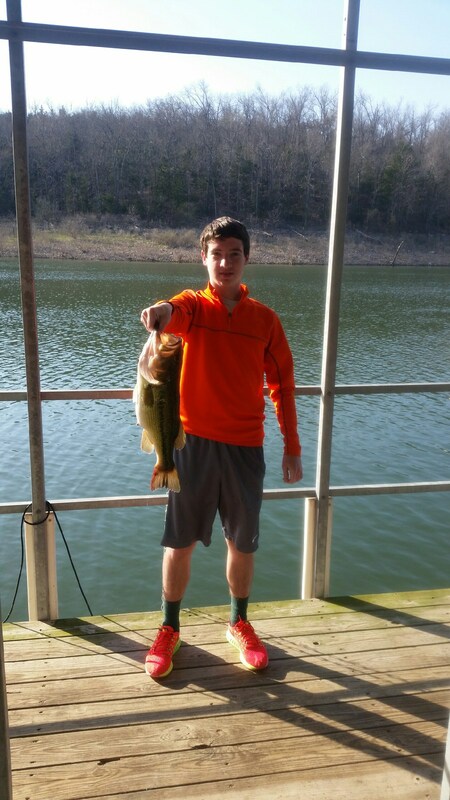 The white bass and largemouth were schooled up in small pods and feeding heavily on shad. Wiggle warts are still working as well as spinners, jerk baits and soft plastics. Watch for top water action early and late in the day. 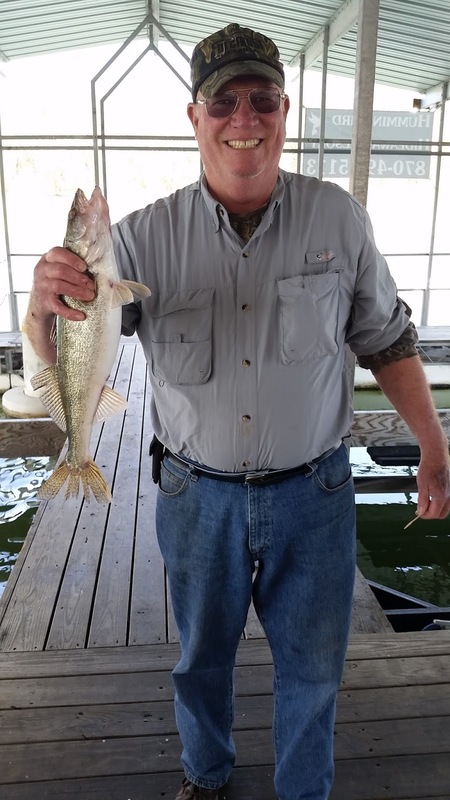 Walleye, white bass and crappie fishing are also heating up. From the fish that I have cleaned the majority of them have not spawned yet. This is getting late for the Walleye and whites, but they are ready. I have found the whites and walleye in the same type of areas as the stripers. Crappie are showing up back in creeks in shallow water around brush. I also ran into a huge school of crappie in the back of a small creek in 35 feet of water. The school was 15 - 30 feet thick. I did not have my crappie rod with me so I used my casting rod with a Kastmaster and vertical jigged up 5 fish before I lost the school. They were not on brush, but roaming and feeding on shad. Norfork Lake level is falling slowly and currently sits at 554.11. The water temperature is slowly rising and was 58 degrees last evening. The creeks, coves and main lake are all stained, with a great fishing color. You can tell that the main lake trying to clear up.